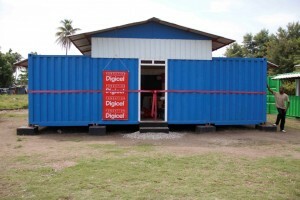 The first school built under an innovative public-private partnership was opened yesterday by the Digicel Foundation and the U.S. Agency for International Development (USAID). École Louis de Borno in Léogâne – the town located at the epicenter of the January 12th earthquake – will welcome 600 primary students when the new school year begins on October 4th. This is the first of a planned 50 schools by the Digicel Foundation to provide permanent and transitional schools for up to 30,000 children, at two shifts per day. Each modular classroom is composed of two ventilated 20-foot shipping containers. The schools will also have administration offices and sanitation and will be furnished with school desks, benches and blackboards provided by the Digicel Foundation. The modular schools have a construction time of about four weeks on site and, although considered transitional, can last up to ten years if necessary. The project is also employing youths for the construction of the schools through the USAID-funded IDEJEN livelihood initiative. IDEJEN provides out-of-school youths aged 15 to 24 with basic, non-formal education and vocational training. This effort, which will employ up to 100 people at a pre-fabrication plant, in addition to those on site assembly, will get money to Haitian families in need, stimulate the economy, and help develop a workforce to participate in upcoming reconstruction efforts. The USAID partnership procured approximately 100 shipping containers for this project which were used as part of the Joint Task Force-Haiti’s humanitarian mission in the aftermath of the earthquake. 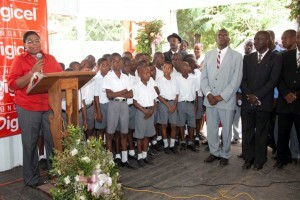 The school in Léogâne will also receive a generous donation of classroom and reference books from the U.S. Embassy in Haiti’s Public Affairs Section. Work has begun on the next site, also in the Léogâne area, for modular schools constructed through this partnership. This is veri interesting to see some good is in the way to save the children in Haiti through Education wich is the best way to bring real change in the life of people for generations to come. However, they don’t mention how the will provide electrical power system in these school buildings. If they miss to include that in the plan, that could be a big problem. They have to put a generator to provide electricity for air conditioning to maintain good climate inside these school buildings. Centre Technique et d’Infomatique is an established and growing computer technical school in Cap Haitian, Haiti. Our regimen for education has a strong emphasis on meeting nation-wide demand for skilled labor, with a post-graduation hiring rate of one-hundred percent. In the interest of furthering our role in the development of Haiti, we are branching out into the field of agriculture. With limited access to quality education, Haitian farmers have immeasurable room to improve in their techniques and practices. However, the majority of existing agriculture schools have little stress on hands-on skills, resulting in a disconnection between theory and practice. Our objective is to ameliorate that disconnection. Three integrable agricultural production systems show particular promise in Northern Haiti: intensive garden-style vegetable production, peanut farming, and dual purpose poultry husbandry. Our school aims to provide a replicable model for each of these systems to young farmers who already possess land. As they progress through the curriculum, the material they learn will be put into practice immediately, with supervision and supplies provided by the school. We have already assembled a network of accomplished individuals, associated with organizations such as Meds and Food For Kids, Sonje Ayiti, Food for the Poor, and Cornell University’s College of Agriculture and Life Sciences. Together we seek to improve the livelihoods of rural Haitian farmers, while fostering a stronger economy and environment for Haiti. If your organization would be interested in supporting or collaborating with us, or would simply like to learn more, please feel free to contact us at wnm3@cornell.edu. The following is an abridged list of expenditures crucial for the success of our school. Any contribution from your organization would be greatly appreciated.